The D.VII wings are simple affairs that look familiar to those with background in the ultralight and very light aircraft community. 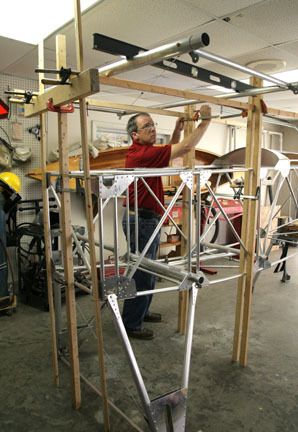 Front and rear tubular spars are joined with tubular compression struts which are braced with drag-antidrag cables. After all the parts were prepared they were blocked out on the bench. 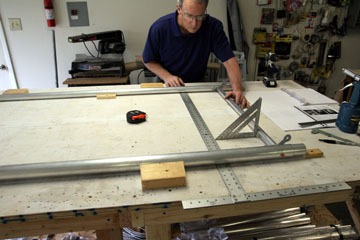 A drywall square is a great aid for setting up the bench for building airplane parts. 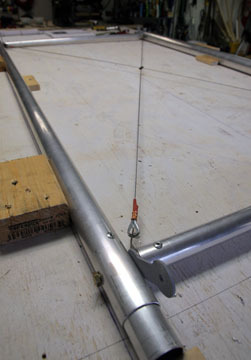 Here the section is being checked for square before rigging the anti-drag cables. Since there are no turnbuckles on the cables, I clamped the free end in vice grips and used a ratchet strap to take out slack in the cables. At the bottom of the photo is a lift tang that is captured between the compression strut and spar. 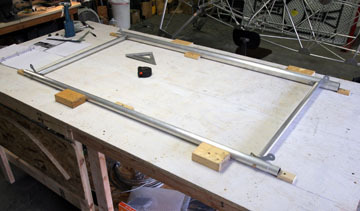 Next step is assembly of the top wing spars to fit the center section. And now...probably the most challenging step of the build thus far--rigging the top wing center section and fabrication of N-struts. This step has to be correct if the plane is to fly in rig. The most daunting aspect of this phase is that it has to be built "in space" via scaffolding. 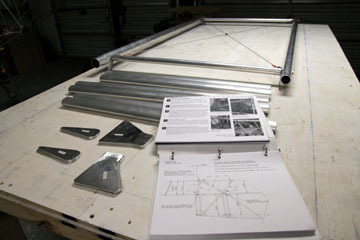 As much effort will be spent in fabricating square jigs as in fabricating airplane parts. 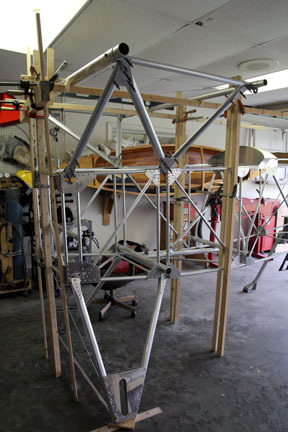 Scaffolding has been erected around the fuse to support the top wing center section as it is moved into proper position. The fuse was carefully leveled laterally, and the tail was raised enough to make a level placed across the lower spar carry-throughs indicate level. 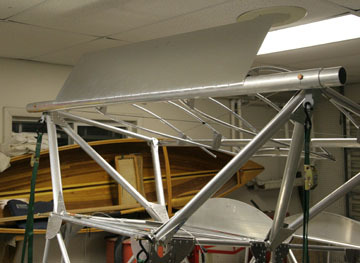 The top section is then positioned so it indicates "level" which makes it fly at the same incidence as the lower wing. It also must be leveled laterally. A plumb bob at the main spar mid-span indicates when it is located exactly in the middle of the fuse. This also assist in locating the spar the correct distance behind the firewall. Initial assembly is with 1/8" clecoes which will eventually be replaced with 3/16" rivets. The 1/8" holes are easier to drill in place without disturbing the setup and allows some latitude for fine tuning the larger holes if necessary. The jig is doing a great job of holding everything in place. Level and plumb is monitored real time to make sure nothing drifts out of alignment. This is what we want, a plumb bob that is on the mark after all strut members have been fabricated and in place. Assembly of the struts is complete, only steps remaining is final drilling for 3/16" rivets, then fabrication of the brace cables. 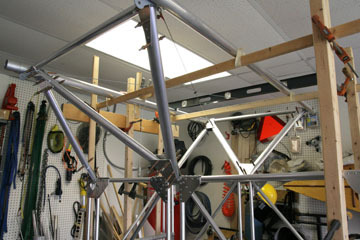 It gets a bit congested in the fixture but makes fabricating a square structure rather easy. The structure really firms up once all the members are in place. One more short work session and this task will be completed. Wing center section is out of traction! The center section seemed to be a good place to sort out the rib building process. 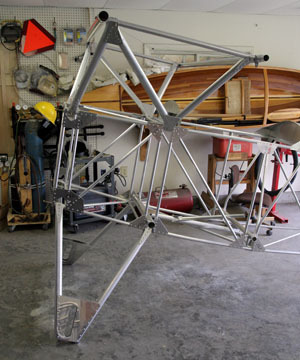 Any inconsistencies or cosmetic flaws won't have consequences in flight rigging the way they would on the wings. 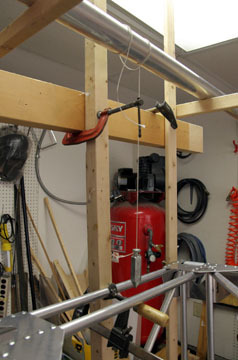 A rib building station was set up and the ribs for the center section were fabricated. 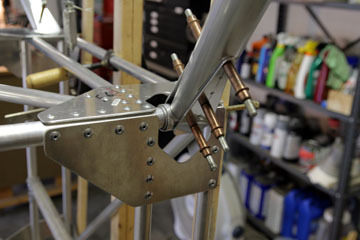 It took a few tweaks of the bending fixture to attain consistent results...but better now than when building wings. I cut the forward end of the ribs with the bandsaw then fine-tuned the coping with the belt sander. I could not find any documentation on how to orient the rib chord in relation to the spars. 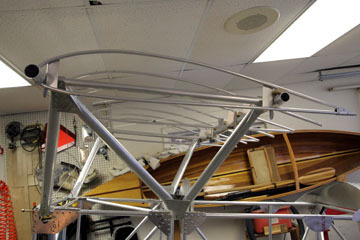 The airfoil appears to be similar to a modified Clark Y so I centered the rear spar between the upper and lower ribs. Turns out my building blocks were the right size to shim the upper rib off the spar. I added gussets to the trailing edge of the tip ribs so the upper and lower ribs could be coped together for a better fit against the wing panel. This is an area that looks especially challenging. 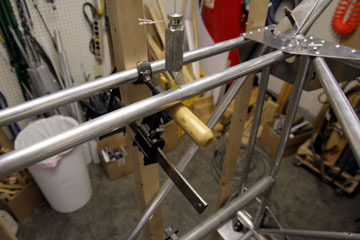 The tip ribs conflict with the lift tangs at the compression struts. 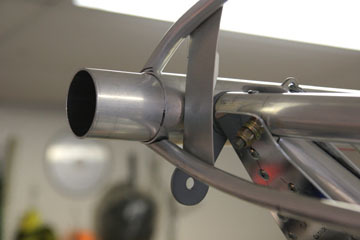 The trailing edges of the center ribs need to be trimmed back to allow access to the cockpit for anything other than a miniature pilot. A relief is shown as "optional" on the plans but there is no guidance on how to make the modification. I have fabricated two 3/8" aluminum "bows" that I'll try to use for the relief once I figure out how to make the trailing edges work out properly. 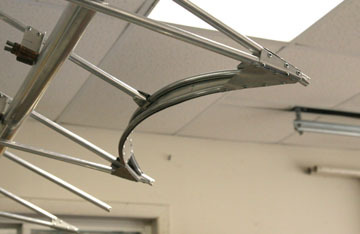 Here are the two bows secured by several gussets. 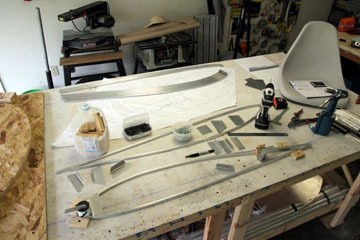 I will add another large gusset spanning the three center ribs so the bows can be used as a handhold. 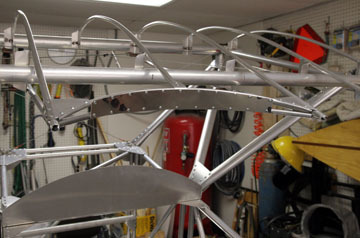 The center section is turning out to be a rather complex step but is good prep for building the wing panels. 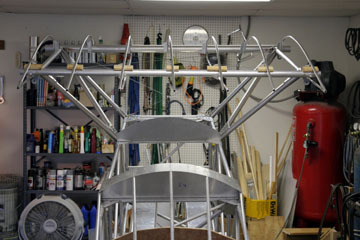 All the skills needed for the wings are being explored and refined while building the center section. Getting going with the leading edge. I cut one piece to 42" so there would be short pieces of equal length on each end. 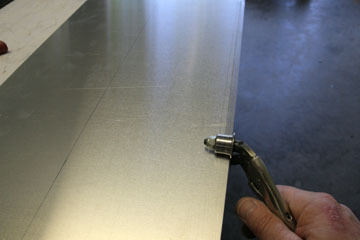 An edge-forming tool was used to put a slight bend in the trailing edge of the leading edge sheet. The will make the sheet lie better under the fabric and stiffen the edge a bit.